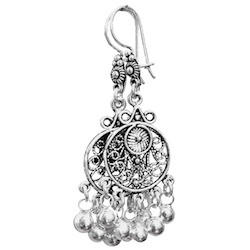 Oxidized telkari (wire art) style dangles terminated by 5 charms on each. Turkish silversmithing excels in creating more volume with less silver mass; this is just another example. All parts are available separately in my store Anatoliana.